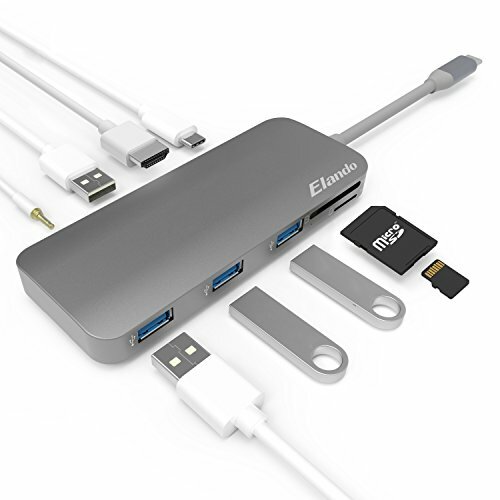 Elando USB-C hub brings marvelous connectivity to your laptop by putting 9 ports into one compact hub so that you never worry about losing connection anywhere. Premium aluminum exterior makes it tough enough to follow you on any adventure. 1. Only one hub is included, power adapters, SD/TF memory cards, cables or other accessories are not included. 2. For best performance, devices connected to this hub should not exceed total current of 900mA maximum when no power source is connected to the hub. Otherwise, output current may become unstable or disconnected. Connect a power adapter to the hub when using high-power devices. 3. The USB-C female port of this product is only for charging USB-C laptops whose USB-C port supports USB Power Delivery (PD). The USB-C female port of this product does not support data transfer. 4. A 4K-capable display and a 4K-capable HDMl cable are required to achieve 4K resolution. If you have any questions about this product by Elando, contact us by completing and submitting the form below. If you are looking for a specif part number, please include it with your message.